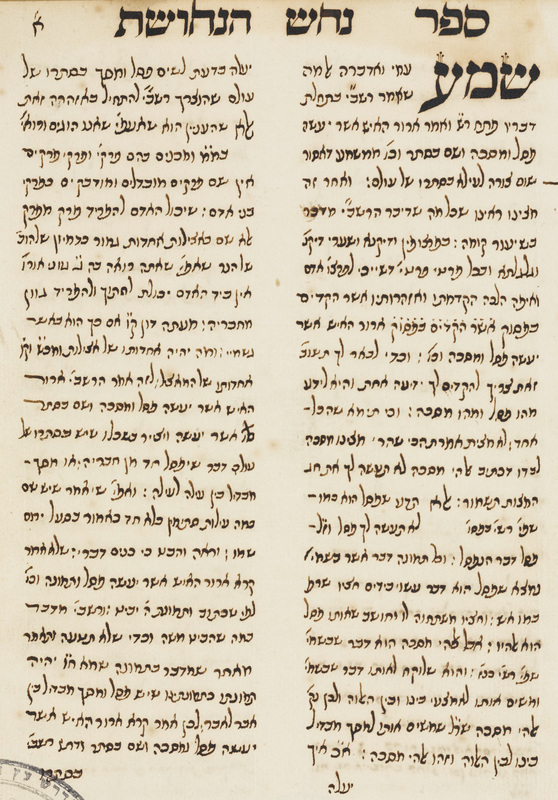 Sefer Nehash ha-Nehoshet. Nehemiah Hiya Hayun’s reply to an attack on him in Ha-Tzad Nahash, by the Italian kabbalist Joseph Ergas. Sefer Nehash ha-Nehoshet. Nehemiah Hiya Hayun’s reply to an attack on him in Ha-Tzad Nahash, by the Italian kabbalist Joseph Ergas. At the end of the work there is a kabbalistic poem with Shabbatean overtones by Hayun. Amsterdam, 1716. Hebrew / Paper / 23,1 x 18,3 cm. / 45 ff. (last 1 blank) / Sephardic cursive writing / 18th century copy.